On February 24, 2015 Mariam Khatiashvili* had the privilege of interviewing Tbilisi State University professor and a scientific instructor of American Studies Students Scientific Group Elene Medzmariashvili. During the hour-long interview professor Medzmariashvili discussed her educational background, scientific researches, and experiences at the universities. 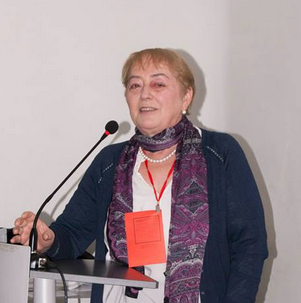 I would like to thank professor Medmzariashvili for taking the time to let us get to know her better. MK: Could you please tell us about your way from studentship to being a successful professor? EM: I graduated from Tbilisi #55 public school and enrolled at Tbilisi State University in the same year. I wanted to become an archeologist but later decided to become the historian of this field. Finally, I applied to the department of the New and Contemporary History and became the member of this chair. At that time studying and working simultaneously was rare. During the post-graduate studentship I participated in the conference on African Studies in Moscow, continued my studies there and maintained my thesis. After Moscow I became the assistant at the department of the New and Contemporary History at Tbilisi State University. I was working 24 hours to be ready for the classes. I was not born in the university, but I have been grown up there and came of my age. MK: When did you start active working in the scientific field? EM: It was when I was freshman. The first article was about Kakheti archeological expedition. I started research, met the instructor of the expedition, went to the museum, etc. My aim when I work on the article is to make the comparative analyze in comparison with Georgia. It started when during one class my professor mentioned England’s Moscow Company that had some close links with Georgia, so I decided to make research on this topic as well. It was the same year when I started traveling across the Soviet Union, attended conference at Tartu University, visited Tashkent and Moscow. At the same time I was working on the publication of the New History Chrestomathy with my professor. MK: When did you start the publications? EM: I was actively involved in the scientific and academic spheres. I was a chairperson of Young Scientists’ Council, worked in the Young Scientists’ Republic Council, was a president of the Young Historian’s Club. Organized the student conferences and published my articles, that was necessary for the obtaining the degree. MK: What is the most significant subject from your curriculum? EM: I do like all subjects that I teach. I should say that all the subjects that I teach are new and meaningful for Georgian academic sphere, including the Introduction in American Studies, the History of Latin America, Women in the U.S. History and Culture of the 20th Century. MK: Could you please tell us the history of the development of American Studies in Georgia? EM: In the 2nd half of the 90’s the laboratory of American history was established at the departments of New and Contemporary History at Tbilisi State University. Georgian American Studies should be grateful for Vasil Katcharava, the first professional American Studies specialist in Georgia. The 1st half of the 21st century was the defining period for Georgian American Studies, it was when it became the interdisciplinary and multidisciplinary field of study. EM: Frankly speaking, I have never thought on this. I think it was the birth of my son from my private life, but from academic it definitely was the international Moscow conference, International Visitors Program and the Fulbright Grant. MK: How do you balance the family and academic affairs? EM: It requires at least 14 hours working per day. MK: How do you see the way to reach the success? EM: It is the way of hard work, talent, ambition and love of the job. MK: Students often lose motivation after fall, what can you advice to them? EM: I think that should win over themselves as I did when I conquested the mountain Gori as a Tbilisi State University student. It was the amazing feeling. You should prove yourself that you can and you will do everything. MK: Which three words describe your teaching method best? EM: Interactive, problematic, and scientific. MK: What are your hobbies? EM: I like travelling. It is the treasure when you can discover new things around you. I do also like reading and watching TV. MK: Who is your favorite American historian? MK: Who is the most citable American author for you? MK: From your perspective, what is the most significant period from American history? EM: 1960s. It was the the richest, busiest and influential period from the U.S. history.